Yesterday’s glorious sunshine was replaced with calm gray. A cloudy but still crisp day, if that’s possible. As I walked into the cool autumn afternoon, Jacqueline du PrÃ©’s Dvorak Cello Concerto came on in my headphone. Her passionate play matched so well with the overcast. The originally gloomy air suddenly seemed to be emotionally charged with energy. The entire bus ride to downtown was turned into a whirlwind journey. Humans are genius at creating something as beautiful, varied, and inspiring as classical music. I was so reluctant to turn it off as I got to the shopping center. Came home as the dusk faded away, I started listening to Janos Starker’s Bach Suites for Solo Cello. This music was so rich and massive, it made me feel warm in the evening chill, warm and happy (okay, i didn’t get to Suite #2 then). Drinking hot chocolate and finished listening to the rest of Bach Suites for Solo Cello during the evening. 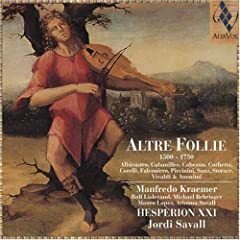 Then moved on to happier music given to me by Matthew – “Altre Folie” a bunch of early music from 1500-1750, performed on old instruments, performed by Jordi Savall‘s ensemble HESPERION XXI. It contains music from a wide range of geographic regions, including Peru(! ), England, and of course Vivaldi. The night is still young, the night sky is still clear, there is a half moon shining down onto the peaceful city. Where is the rain? Clicking on the album cover above you get to the detailed description of what a Folia is. A form of a dance music originated in Portugal’s country side, and often performed on Viol (viola da gamba, the ancient form of Cello). I’m not sure if any of the music in this album is performed on Viol, maybe it is all on on modern day violin? For anyone who is interested in viol itself, check out this movie “Tous les matins du monde” (All the Mornings of the World). It is about a famous viola da gamba player Monsieur de Sainte Colombe. The movie strongly resembles Barry Lyndon‘s mannerism and cinematography. But the story is simpler and worth seeing. Many music was played on the ancient viola da gamba throughout the movie. Jordi Savall and his ensemble did all the music adaptation and performing for the movie.